How do I clean my Northern Virginia Pond? Not all water features require an annual cleanout. If there is a layer of “crud” at the bottom of the pond and the water is dark in color, it would be a good idea to do a full clean-out. If there is just a small amount of debris that you can stir up and capture with a net and the water looks clear, a little tidying up and small water change is all that’s in order. The best time to perform a pond clean-out is before the water temperature in the pond creeps above 55º F. If a clean-out is performed when the water is warmer, after bacteria colonies form, the balance of the ecosystem will again be thrown off. Buckets to collect leaves and debris. 1. Place the clean-out pump in the deepest point of the pond or in the Pondless® Waterfall Vault or Snorkel in order to remove the water. 2. Drain the water into the surrounding landscape. Be sure to relocate the pipe two or three times to allow the water to seep into the ground and not flood the yard. 3. If you have fish, use some of this pond water to fill up the holding pool. The fish can be removed from the pond using a net once the water is around knee-high so you can easily catch them. 4. Don’t keep the fish in the holding pool for more than several hours. Keep them in a shady spot with a net over the top of the pool to prevent them from jumping out. 5. If you have a winter aerator or bubbler, you can use it in the holding pool to help oxygenate the water. 1. Rinse the inside of the pond. You can also use a pressure washer to help remove debris from the rocks and gravel. 2. Don’t try to scrub all of the algae away. Some algae on the rocks will prove beneficial in developing your ecosystem. 3. Use the gentle stream from a garden hose to rinse the rocks and gravel. Start at the top and work your way down to the bottom. 4. Periodically turn the clean-out pump on to remove the dirty water. You can discontinue the periodic pumping once the water rinsing down to the bottom begins to look clear. 5. Remove the pump and begin filling the pond with the garden hose. 1. Remove any debris from the bottom of the skimmer or Pondless Vault. This can be done by hand or by using the cleanout pump. 2. Remove the media nets and filter pads from the BioFalls® filter, and rinse them off so they are free of debris. Finally, you can put your fish back into their clean home. 1. If you’re on city water, it’s imperative that you add Pond Detoxifer to the water so it is safe for fish. 2. Dip a five-gallon bucket, or similar sized container, in the holding tank and fill it with water. 3. After about 15 minutes, periodically begin splashing some pond water into the bucket. 4. By now, the temperature of the pond and the bucket water should be close to the same. You are ready to put the fish into their spring-cleaned home. These steps will ensure your pond is ready for another season. Looking for professional pond cleaning help? The Pond Doctor has 10 years of experience building and maintaining ponds in the Northern Viginia area. We can professionally clean your pond for you, so you can spend more time enjoying your pond and gain peace of mind knowing that your pond has been cleaned correctly. Give us a call at 540-272-6866 to schedule your Spring pond cleaning service today. Or visit us at www.theponddoctor.com. 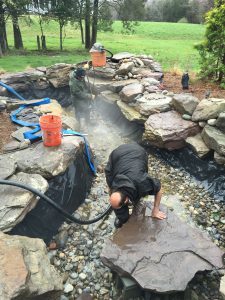 How Much Does a Backyard Water Feature Cost?